tstet.cgg.gov.in TSTET 2019 Telangana Teacher Eligibility Test 2019 Notification Online Application & Exam Date : TS Teachers Eligibility Test TSTET 2019 Notification Exam Pattern Syllabus Study Material Download: TS Teachers Eligibility Test 2019 Schedule to be Released shortly in Telangana. Teacher job in Govt and Private Schools aspirants here have good news. SCERT Telangana has started preparations to release TSTET 2019 Notification. Officials of School Education Department, TS busy at setting up Telangana TET 2019 Syllabus , Exam Pattern Eligibility criteria Schedule dates Online Application Process. Next year onwards Teachers working in Private Schools also should qualify TET and morever the early AP TET 2011, 2012 qualified candidates also have to appear TSTET 2019 because their TET Certificate Eligibility expired as the certificate valid for 7 years only as per the officials mentioned in the concern Notifications. To get qualify TS Teachers Eligibility Test 2019 , candidates have to go through the Notification TSTET 2019 Syllabus for Paper I and Paper II, Eligibility criteria Educational and Professional qualifications Important dates for Fee Payment , Submit Online Application Form, Downloading of Hall Tickets, Exam Dates announcement of Preliminary, Final Keys, Release of Results Ranks Marks Memo TSTET 2019 Notification Information TSTET 2019 Telangana Teacher Eligibility Test 2019 Notification Online Application & Exam Date at tstet.cgg.gov.in. Telangana TET 2019 Online Application, Notification , Exam Date. Telangana (TS) TET Notification 2019 Apply Online. Online applications are invited from the eligible candidates who intend to be teachers for classes I to VIII in schools in Telangana State for appearance in the First Telangana Teacher Eligibility Test (TS-TET 2019) to be conducted by Department of School Education, Government of Telangana State in all Districts of the State. 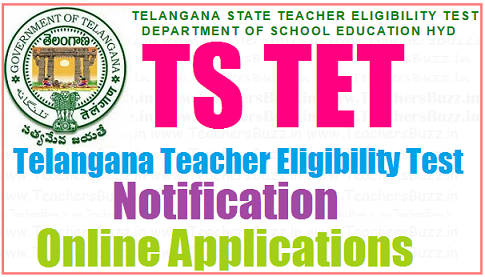 Telangana (TS) TET Notification 2019, Online Application, TS TET Eligibility Criteria, TS TET Notification 2019 Selection Process,TS TET Notification 2019, Procedure for submission of TSET application online, Examination Centers for TS-TET 2019, Minimum Qualification for TS-TET Paper-I (Class I TO V) , Minimum Qualifications for TS-TET Paper - II (Classes VI to VIII), Fee details, Hall Tickets, Results, Scoring/weightage marks details are given here. Telangana State Government going to circulate a wonderful notification for the aspirants who are looking for teaching job in the state from class I to VIII. The state is going to fill up vacant posts of teaching vacancy through Teacher Eligibility Test (TET). So, the Department of School Education Telangana state is going to announce the TSTET 2019/ Telangana State Teacher Eligibility Test Notification before the teacher recruitment test/TS DSC 2019 in Telangana. As per the reports the TS TET Detailed Notification 2019 is to be announced in before end of the year and more than two lacks of candidates are ready to apply to the Telangana Teacher Eligibility test 2019. According the information Nearly 2.5 lacks of Candidates are going apply to the Telangana Teacher Eligibility test . Department of School Education, Government of Telangana State is inviting online applications from the eligible candidates who intend to be teachers for classes I to VIII in schools in Telangana State for appearance in Telangana Teacher Eligibility Test 2019- TSTET 2019 in all 31 Districts of the State. Read on to know Telangana State Telangana Teacher Eligibility Test 2019 application procedure, eligibility criteria, important dates, test pattern, syllabus and other details on Telangana Teacher Eligibility Test 2019. A. Weightage for TS-TET Scores in "TS TRT": 20% weightage will be given to TS-TET scores in the ensuing Teacher Recruitment of the State Government i.e., 20% weightage is for TS-TET score and 80% weightage for written test in Teacher Recruitment Test (TRT). Online applications are invited from the eligible candidates who intend to be teachers for classes I to VIII in schools in Telangana State for appearance in the Telangana Teacher Eligibility Test (TS-TET-2019) to be conducted by Department of School Education, Government of Telangana State on 23rd July 2019 in all 31 Districts of the State. In accordance with the provisions of sub section (1) of section 23 of the Right to Education Act (RTE), 2009, the National Council for Teacher Education (NCTE) had vide it’s Notification dated 23rd August, 2010 laid down the minimum qualifications for a person to be eligible for appointment as a teacher for classes I to VIII. It had been inter alia provided that one of the essential qualifications for a person to be eligible for appointment as a teacher in any of the schools referred to in clause (n) of section 2 of the RTE Act is that she/he should pass the Teacher Eligibility Test (TET) which will be conducted by the appropriate Government in accordance with the Guidelines framed by the NCTE. Accordingly, Government of Telangana State has issued guidelines for conducting Teacher Eligibility Test in Telangana State vide G.O cited in the reference above. All candidates who possess D.Ed./ B.Ed. / Language Pandit or equivalent qualifications and candidates pursuing final year of the said courses with requisite percentage of marks obtained as given in the Information Bulletin of TS-TET-2019 and who aspire to become teachers for classes I to VIII in the schools of the State Government, Mandal Parishad, Zilla Parishad Schools, Private Aided Schools and Private unaided schools in Telangana State can appear for TS-TET. The candidates who did not qualify in the 1st, 2nd and 3rd and 4th APTETs and 1st TS-TET 2019 can also apply for the TS-TET-2019. Further, the candidates who got qualified in the earlier TETs can also apply for TS-TET-2019 if they desire improvement over their previous TET score. The TS-TET-2019 will be conducted in 2 papers viz. Paper-I & Paper-II. The candidates who intend to be teachers for classes I to V have to appear for Paper-I and the candidates intend to be teachers for classes VI to VIII have to appear for Paper-II. The candidates who intend to be teachers for all classes from I to VIII can appear for both papers, Paper-I and Paper-II. The candidates at the time of applying for TS-TET 2019 should be in possession of the minimum qualifications prescribed for a teacher for I to V classes (Paper-I) and VI to VIII classes (Paper-II) as given in Information Bulletin. Intermediate / Senior Secondary (or its equivalent) with at least 50% marks (45% for SC/ ST/ BC/ Differently abled candidates) OR passed in 2 years Diploma in Elementary Education / 4-year Bachelor of Elementary Education (B.El.Ed.) / 2 – year Diploma in Education (Special Education). Candidates passed ) Intermediate / Senior Secondary (or its equivalent) with at least 45% marks (40% for SC/ST/BC/Differently abled candidates) and pass in 2 year Diploma in Elementary Education / 4-year Bachelor of Elementary Education (B.El.Ed.) / 2 year Diploma in Education (Special Education) in case of the candidates who have passed or admitted to D.El.Ed / D.Ed. course prior to issue of these guidelines can also apply for TSTET 2019. Minimum qualifications for TS-TET 2019 PAPER-II (CLASSES VI TO VIII): B.A./B.Sc./B.Com., with at least 50% marks (45% for SC/ST/BC/Differently abled candidates) and pass in Bachelor of Education (B.Ed) course / Bachelor of Education (B.Ed -Special Education). Candidate pass 4-year B.A.Ed/B.Sc.Ed., with at least 50% marks (45% for SC/ST/BC/Differently abled candidates) OR passed Graduation with language concerned as one of the optional subjects OR Bachelor of oriental language (or its equivalent) OR Graduation in literature OR Post Graduation in language concerned AND Language Pandit Training Certificate/B.Ed with language concerned as one of the Methodologies, in respect of Language Teachers can also apply for TSTET 2019. The candidates who are pursuing final year of any of the Teacher Education Courses recognized by the NCTE or the RCI, as the case may be, and / or the Language Pandit Training Courses can also appear for the First TS-TET 2019. Eligible Candidates can only through TS-TET website http://tstet.cgg.gov.in. Submit the application fee of Rs.200.00 per paper I or paper II or both through TS Online or Payment Gateway centers for submission of application Online. There will be two papers of the TET, Paper-I will be for a person who intends to be a teacher for Classes I to V, Paper-II will be for a person who intends to be a teacher for Classes VI to VIII. A person who intends to be a teacher either for classes I to V or for classes VI to VIII shall have to appear for both papers (Paper I and Paper II) (if eligible). Paper- I will consist of 150 Multiple Choice Questions (MCQs) of 150 marks. Duration of Examination will be 2 hours and 30 minutes. Paper- II will consist of 150 Multiple Choice Questions (MCQs) of 150 marks. iv (a) For Mathematics and Science teachers: Mathematics and Science. Physically disabled with at least 40% disability only will be considered in respect of visually and orthopedically disabled. With regard to Hearing Impaired, minimum 75% disability will be considered under PH category. The examination related material will be preserved for six months from the date of examination and no application in this regard will be entertained beyond this period.